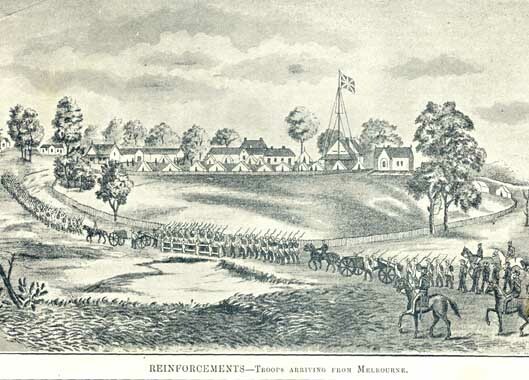 Reinforcements - Troops Arriving from Melbourne, This image shows the Camp at Ballarat West, know Camp Street. Ballarat Heritage Services Picture Collection. Robert Monckton and Benden S. Hassell became flour millers in 1856 and the Argus reported that they were ready “to commence the erection of a large and complete mill” at the swamp. This was Yuille’s Swamp which is now known as Lake Wendouree. Bendan Hassell and Robert Monckton returned to England in 1865 after selling their flour mill on Wendouree Parade to Mr Fry of Ascot for £4,500. When they returned to England they were both quite rich men. Benden S. Hassell gave evidence before Peter Lalor on 5 March 1856. 17 December 1862 Benden S Hassell wrote to the Chairman of the Municipal Council of Ballarat resigning from the Council. Sir, Having business to ?act in a remote part of the Colony I am under the necessity of resigning my seat in your Council as it is more than probable that I shall not return during the present municipal years. I am yours respectfully Benden S Hassell. Benden Hassell was quite rough and unpolished person. Upon return to England as a wealthy man Benden Hassell lived in the genteel society of Surrey Hills where no doubt he was known as a coarse adventurer with newly acquired fortune. Benden Hassell married the sister of Robert Monckton. 1 child - Reggie who married a Monckton cousin. Their daughter was born mentally and physically handicapped. ↑ Information from Descendant Christopher Monkton, 14 March 2017. ↑ Ballaarat Outbreak Petition, Government Printer, Melbourne, 14 March 1856. This page was last edited on 16 April 2018, at 11:49.